Habit: Annual to biennial. Stem: erect, simple or branched at base. Leaf: on flower stem generally alternate, sessile, linear, entire to dentate, pinnately veined; on non-flowering stems whorled, generally wider. Inflorescence: raceme, terminal; bracts reduced, alternate. Flower: calyx lobes 5, deep, +- equal; corolla 5-lobed, unequally 2-lipped, lower lip >> upper, lower side of tube spurred at base or spur 0, lower side of throat swollen, +- hairy, +- closing corolla proximal to lips; stamens 4, in 2 pairs, included; stigma small, unlobed. Fruit: dehiscent by slits into chambers near tip, +- spheric. Seed: many, prismatic, 4--7-angled, faces smooth or tubercled. Habit: Generally glabrous. Stem: 10--60 cm, slender, with decumbent non-flowering shoots. Leaf: 5--25 mm, narrowly linear, obtuse. Inflorescence: raceme, dense in flower, open in fruit, +- glandular-puberulent; pedicels 1.5--6 mm, > bracts; flowers opening or cleistogamous. Flower: calyx +- 3 mm, lobes lance-linear, tips acute; corolla 10--24 mm (including spur), violet to blue, lips spreading, lower lip 6--11 mm, >> upper, throat swelling +- obscure, white-ridged, spur 6--11 mm, straight or curved, slender. Fruit: +- 3 mm. Seed: 0.5 mm, faces +- tubercled. Chromosomes: n=12. Synonyms: Linaria canadensis (L.) Dum.Cours. var. 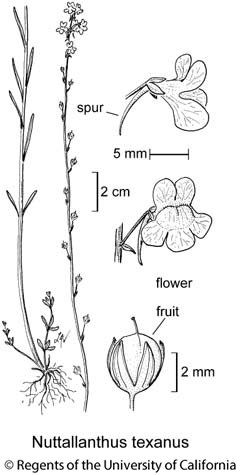 texana (Scheele) Pennell; Linaria canadensis (L.) Chaz., in part, misappl. Citation for this treatment: Robert E. Preston & Margriet Wetherwax 2012, Nuttallanthus texanus, in Jepson Flora Project (eds.) Jepson eFlora, http://ucjeps.berkeley.edu/eflora/eflora_display.php?tid=34756, accessed on April 19, 2019. NW (exc NCoRH), SNF, GV, CW, SW (exc SnBr, SnJt), DMtns (Granite Mtns, w San Bernardino Co.); Markers link to CCH specimen records. Yellow markers indicate records that may provide evidence for eFlora range revision or may have georeferencing or identification issues. Purple markers indicate specimens collected from a garden, greenhouse, or other non-wild location.